Supplemental front-impact air bag system: The NISSAN Advanced Air Bag System can help cushion the impact force to the head and chest of the driver and front passenger in certain frontal collisions. Front seat-mounted side-impact supplemental air bag system: This system can help cushion the impact force to the chest area of the driver and front passenger in certain side impact collisions. The side air bags are designed to inflate on the side where the vehicle is impacted. Roof-mounted curtain side-impact supplemental air bag system: This system can help cushion the impact force to the head of occupants in front and rear outboard seating positions in certain side-impact collisions. The curtain air bags are designed to inflate on the side where the vehicle is impacted. 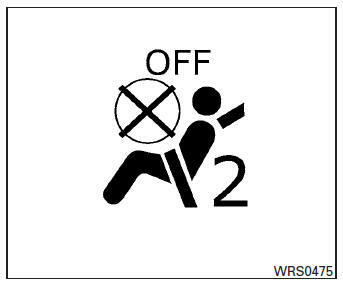 See “Seat belts” in this section for instructions and precautions on seat belt usage. The supplemental air bags operate only when the ignition switch is in the ON position. The front passenger air bag will not inflate if the passenger air bag status light is lit or if the front passenger seat is unoccupied. See “Front passenger air bag and status light” in this section. See “Front Passenger air bag and status light” in this section. 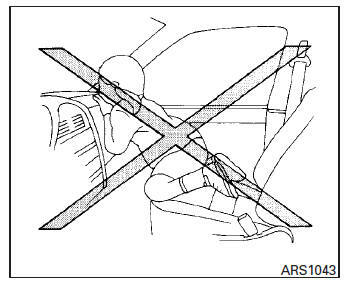 Even with the NISSAN Advanced Air Bag System, never install a rear-facing child restraint in the front seat. An inflating front air bag could seriously injure or kill your child. See “Child restraints” in this section for details. The side air bags and curtain air bags ordinarily will not inflate in the event of a frontal impact, rear impact, rollover or lower severity side collision. Always wear your seat belts to help reduce the risk or severity of injury in various kinds of accidents. When sitting in the rear seat, do not hold onto the seatback of the front seat. If the side air bag inflates, you may be seriously injured. Be especially careful with children, who should always be properly restrained. Some examples of dangerous riding positions are shown in the illustrations. Do not allow a passenger in the rear seat to push or pull on the seatback pocket. Do not position the front passenger seat so it contacts the rear seat. If the front seat does contact the rear seat, the air bag system may determine a sensor malfunction has occurred and the front passenger air bag status light may illuminate and the supplemental air bag warning light may flash. If a forward facing child restraint is installed in the front passenger seat, do not position the front passenger seat so the child restraint contacts the instrument panel. If the child restraint does contact the instrument panel, the system may determine the seat is occupied and the passenger air bag may deploy in a collision. Also the front passenger air bag status light may not illuminate. 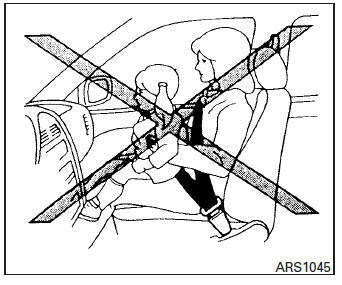 See “Child restraints” in this section for information about installing and using child restraints. This vehicle is equipped with the NISSAN Advanced Air Bag System for the driver and front passenger seats. This system is designed to meet certification requirements under U.S. regulations. It is also permitted in Canada. All of the information, cautions and warnings in this manual must be followed. The NISSAN Advanced Air Bag System has dual stage inflators. It also monitors information from the crash zone sensor, the Air bag Control Unit (ACU), seat belt buckle sensors and Occupant Classification Sensor (weight sensor). Inflator operation is based on the severity of a collision and seat belt usage for the driver. For the front passenger, the occupant classification sensors are also monitored. Based on information from the sensors, only one front air bag may inflate in a crash, depending on the crash severity and whether the front occupants are belted or unbelted. If the front passenger air bag is OFF, the passenger air bag status light will be illuminated (if the seat is unoccupied, the light will not be illuminated, but the air bag will be off). See “Front passenger air bag and status light” in this section for further details. One front air bag inflating does not indicate improper performance of the system. OFF and the front passenger air bag is OFF and will not inflate in a crash. that the front passenger air bag is operational. The occupant classification sensors (weight sensors) are on the seat cushion frame under the front passenger seat and are designed to detect an occupant and objects on the seat. For example, if a child is in the front passenger seat, the Advanced Air Bag System is designed to turn the passenger air bag OFF in accordance with the regulations. Also, if a child restraint of the type specified in the regulations is on the seat, the occupant classification sensors can detect it and cause the air bag to turn OFF. The front passenger seat belt sensor is designed to detect if the seat belt is buckled. Based on the weight on the seat detected by the occupant classification sensor and the buckle state, the Advanced Air Bag System determines whether the front passenger air bag should be automatically turned OFF as required by the regulations. NISSAN also recommends that appropriate child restraints and booster seats be properly installed in a rear seat. If this is not possible, the occupant classification sensor and seat belt sensors are designed to operate as described above to turn the front passenger air bag OFF for specified child restraints as required by the regulations. 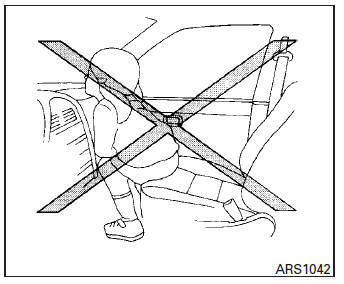 Failing to properly secure child restraints and to use the ALR mode (child restraint mode) may allow the restraint to tip or move in an accident or sudden stop. This can also result in the passenger air bag inflating in a crash instead of being OFF. 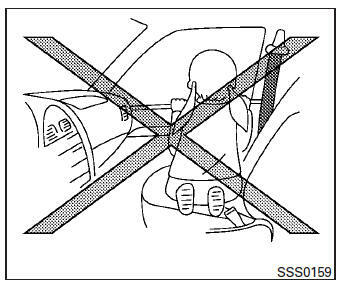 See “Child restraints” in this section for proper use and installation. If the front passenger seat is not occupied the passenger air bag is designed not to inflate in a crash. However, heavy objects placed on the seat could result in air bag inflation, because of the object’s weight detected by the occupant classification sensor. 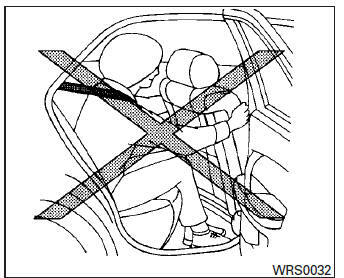 Other conditions could also result in air bag inflation, such as if a child is standing on the seat, or if two children are on the seat, contrary to the instructions in this manual. and gauges area in the center of the instrument panel, will blink. Do not place objects with sharp edges on the seat. Also, do not place heavy objects on the seat that will leave permanent impressions in the seat. Such objects can damage the seat or occupant classification sensors (weight sensors). Do not use water or acidic cleaners (hot steam cleaners) on the seat. This can damage the seat or occupant classification sensors. This can also affect the operation of the air bag system and result in serious personal injury. Work on and around the front air bag system should be done by a NISSAN dealer. Installation of electrical equipment should also be done by a NISSAN dealer. The Supplemental Restraint System (SRS) wiring should not be modified or disconnected. Unauthorized electrical test equipment and probing devices should not be used on the air bag system. When selling your vehicle, we request that you inform the buyer about the supplemental front air bag system and guide the buyer to the appropriate sections in this Owner’s Manual. 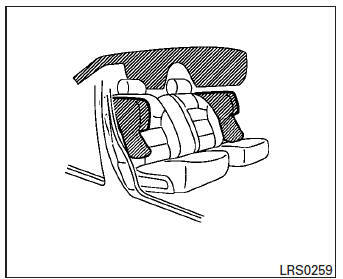 The side air bags are located in the outside of the seatback of the front seats. The curtain air bags are located in the side roof rails. All of the information, cautions and warnings in this manual must be followed. The side air bags and curtain air bags are designed to inflate in higher severity side collisions, although they may inflate if the forces in another type of collision are similar to those of a higher severity impact. They are designed to inflate on the side where the vehicle is impacted. They may not inflate in certain side collisions. Side air bags, along with the use of seat belts, help to cushion the impact force on the chest of the front occupants. Curtain air bags help to cushion the impact force to the head of occupants in the front and rear outboard seating positions. They can help save lives and reduce serious injuries. However, an inflating side air bag and curtain air bag may cause abrasions or other injuries. 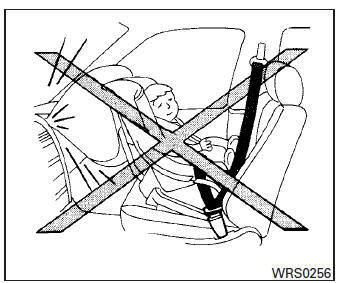 Side air bags and curtain air bags do not provide restraint to the lower body. The seat belts should be correctly worn and the driver and passenger seated upright as far as practical away from the side air bag. Rear seat passengers should be seated as far away as practical from the door finishers and side roof rails. The side air bags and curtain air bags inflate quickly in order to help protect the front and rear outboard occupants. Because of this, the force of the side air bag and curtain air bag inflating can increase the risk of injury if the occupant is too close to, or is against, these air bag modules during inflation. The side air bags and curtain air bags will deflate quickly after the collision is over. The side air bags and curtain air bags operate only when the ignition switch is in the ON position. No unauthorized changes should be made to any components or wiring of the side air bag and curtain air bag systems. This is to prevent damage to or accidental inflation of the side air bag and curtain air bag or damage to the side air bag and curtain air bag systems. Do not make unauthorized changes to your vehicle’s electrical system, suspension system or side panel. This could affect proper operation of the side air bag and curtain air bag systems. * The SRS wiring harness connectors are yellow and orange for easy identification. 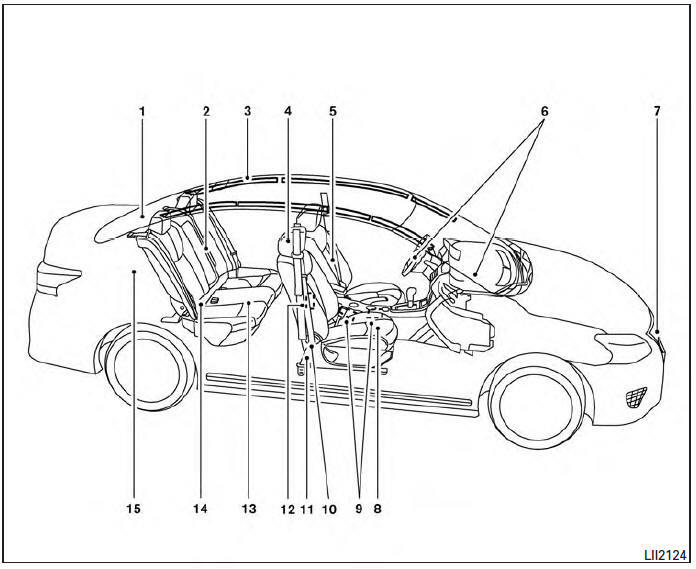 When selling your vehicle, we request that you inform the buyer about the side air bag and curtain air bag systems and guide the buyer to the appropriate sections in this Owner’s Manual. The pretensioners cannot be reused after activation. They must be replaced together with the retractor and buckle as a unit. The pretensioner is encased within the seat belt retractor. These seat belts are used the same way as conventional seat belts. The supplemental air bag warning light is used to indicate malfunctions in the pretensioner system. 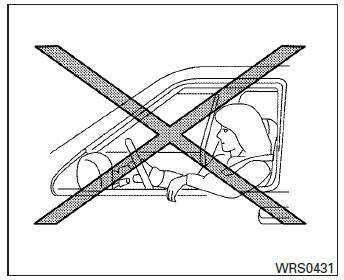 (See SUPPLEMENTAL AIR BAG WARNING LIGHT in this section for more details.) If the operation of the supplemental air bag warning light indicates there is a malfunction, have the system checked by a NISSAN dealer.